For me all the seasons are just smashed into one, this post might be themed for spring but who even knows when spring actually is in the UK. It can be flip-flops and strappy tops weather one minute, then the next its jumpers and boots. This in between weather has meant one thing, finding the right balance for my makeup. Having a matte coverage is still important as oil is a issue but still keeping it glowy and bronze. These are the products that I've been applying to my face almost everyday and they never let me down in terms of longevity and suitability. Everyday I am learning new things about my skin, face and body included. 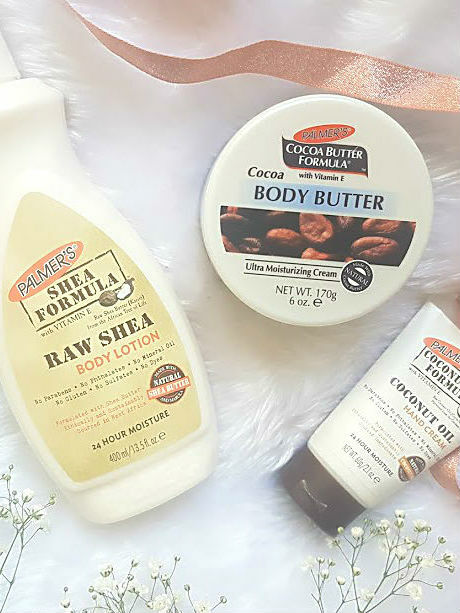 My arms and legs are always dehydrated and I've found the Cocoa Body Butter* from Palmer's to be the only thing that helps to combat it. The Vitamin E enriched formula sinks straight in, to leave my arms and legs feeling super soft and I haven't had peeling skin since using this. My face is also lacking hydration but my worry is that using too many hydrating products will make it oily throughout the day. That's why my morning skincare routine has cut down to just a cleanser and moisturiser, hopefully this will help to tackle all the issues. The Raw Shea Body Lotion* is great to use on the face as it is really lightweight, it contains a combination of vitamin E, grape seed oil and oatmeal to calm skin irritation and give you a radiant glow. Applying this straight after a shower feels amazing on the skin and doesn't feel greasy. Coconut Oil Hand Cream* is one product that you need in your life, I didn't even know that Palmer's had a coconut oil range but since discovering this hand cream, I need everything else. Using a little bit of this throughout the day keeps my hands hydrated and feeling silky smooth. Due to the body lotion adhering to my skin, there's no need for primer! Love the idea of not layering too many products. Estee Lauder Double Wear really is worth all the hype, I apply this almost everyday because it's trustworthy. It covers all the aliens that have invaded my face and lasts through rain or shine. I also bought a pump for it - best decision ever made. I've become obsessed with concealer recently, it's all I want to buy. 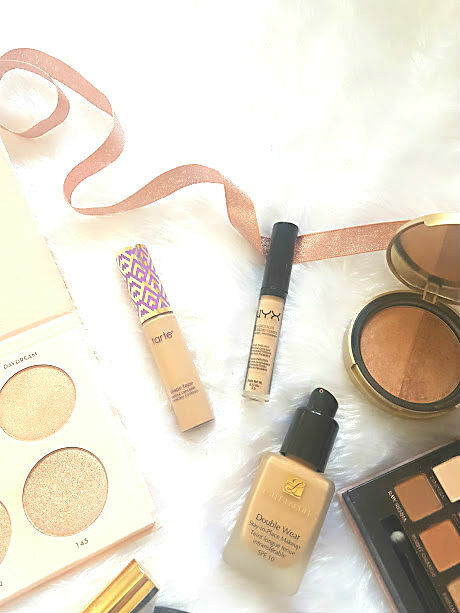 The Tarte Shape Tape is great to use on spots and the NYX HD is great to use under the eyes and down the nose to brighten. These three together form my perfect base. The Too Faced bronzer is the only bronzer I seem to wear, it is constantly appearing on here and on instagram. The light and dark colour mixed together suits my skin perfectly, but I think I need to branch out and try a new one so any recommendations welcome. For highlight it is of course the ABH Nicole Glow Kit. It may seem a bit heavy for everyday but a light tapping on the cheeks is perfect, I want to get my money's worth out of it and everyday use is the only way I am going to achieve this. 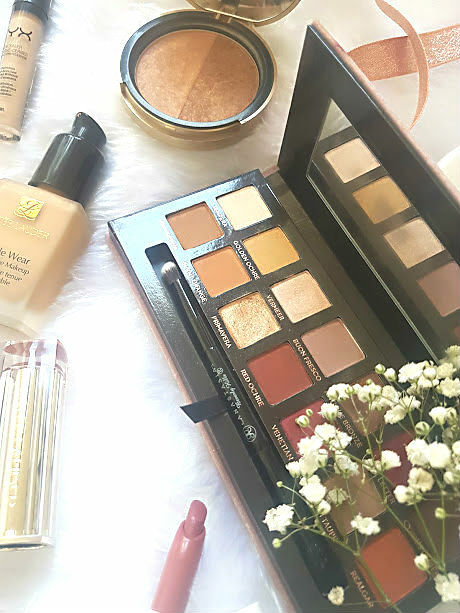 I published a post the other week all about the best everyday eye palettes but left the ABH Modern Renaissance Palette out of it. Not because I hate the palette, but because I don't really find myself using and wearing the entire palette everyday. I only ever use the six shades towards the left hand side of the palette. They're gorgeous shades to use everyday and look lovely with any lip. Mascara is one product that I love swapping and changing, one day it could be the Maybelline Lash Sensation and the next it could be Tarte Man Eater. Whichever my hand picks up first is what I tend to go for, as long as it gives my lashes some life. If you didn't already know then I am addicted to lip products, all different formula's and types. In this post trying to choose just one product to feature was too hard, so I had to include three - all three are my go to at the moment and of course the same shade. The Bare Minerals Liquid Lip In Juju* is a gorgeous formula that will last all day compared to the other two, its one that I can trust to stay put and look nice. Then we have the Colourpop Lippie Stick in Lumiere, the formula of these are amazing, very creamy and pigmented but they don't last very long so I tend to keep it with me on long days to top up. Finally there's a new addition to the collection and it's from Estee Lauder's Pure Colour range, the packaging for these are very fancy indeed and the lipstick inside is even better. I have the shade Blaise Buff, that is moisturising and gorgeous. 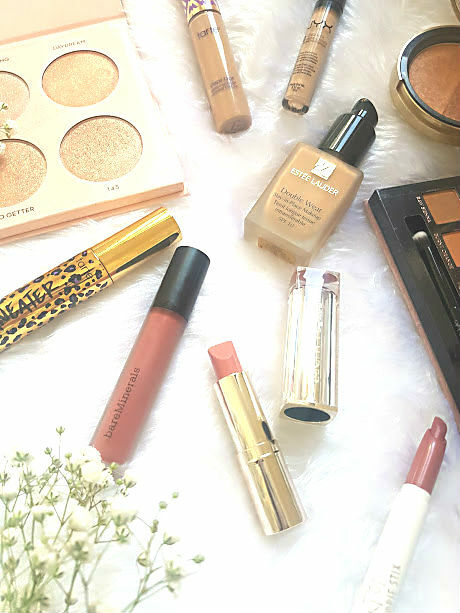 In the end all these products work together to give me a long lasting and matte yet glowy look! What are your picks for the spring? !